Back in June it was announced that a shortlist of three cities had been made from over 22 applicants, all wanting to be England's first "City of Football". Last month it was revealed that Nottingham was to be given the crown and £1.6m of Lottery funding. This immediately led to local gnashing of teeth. Yet again Sheffield ignored and then the question was asked, rightly given the city’s reticence in adequately selling itself, did we even apply? After several tweets to various bodies and not a lot of response I finally found out that Sheffield had applied, but the bid was ultimately unsuccessful. The City of Football initiative was an opportunity for cities to propose new ways of opening up football opportunities for everyone. In that regard it could be argued that Sheffield doesn't need that help. These cities showed a commitment to get more people playing the sport at grassroots level, a possible area of weakness for them, but not for the Steel City. In effect the title is a bit of a misnomer, maybe the name “City of Football Development” would have been better. But this got me thinking. Sheffield knows its place in the global game, but does the World really know about Sheffield's contribution? We all assume it does. FIFA made Sheffield FC one of only two clubs to receive their Order of Merit (alongside Real Madrid) in 2004, but there is little recognition by national football authorities. The more I thought about it the more I realised that people in this country don't know enough about Sheffield's place in football history, never mind people in the rest of the world, and over time that position will only be increasingly marginalised. Sheffield has a unique selling point and not enough is made of this. As far as Sky Sports are concerned football history started in 1993. If they do not have the footage then it didn’t really happen. The FA celebrated its 150th anniversary in 2013 and their celebrations focused on the formalisation of football in this country, you would never know that football had been codified and played competitively for some 6 years prior to that. Not by teams such as the Wanderers and Royal Engineers who replayed the first FA Cup final at the Oval, but in the smog and grime of the Steel City under the watchful gaze of football pioneers, Nathaniel Creswick and William Prest. Only last Friday Sheffield FC celebrated 157 years, their twitter timeline a series of retweets from football fans and clubs from across the globe wishing the club well. Yet a look to the @FA timeline showed no recognition, no congratulations. Two days later the Football Association twitter feed announced its 151st birthday; “On 26 October 1863, the Founding Fathers met to form the first set of rules”. A link to the FA website led to an article talking about the formation of the Association and the codification of the first Laws of the Game. 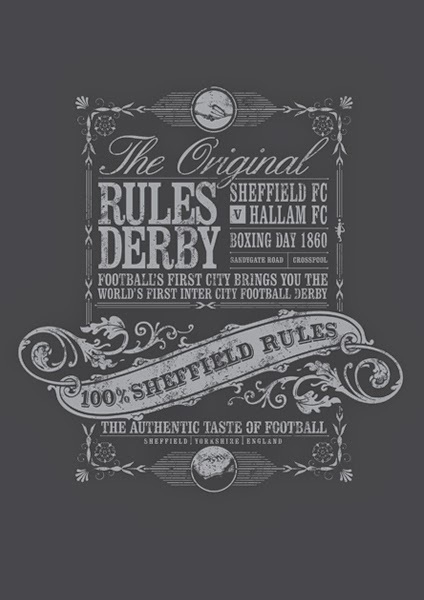 Sheffield air-brushed from football history, possibly because they didn’t fall in line with the FA after its formation. So to this post. This blog is called A United View, but for once it is A Sheffield View. This is not about us versus them, Blade versus Owl, Red versus Blue, it's about working smarter for each individual club's benefit, the collective benefit of all clubs and the city overall. To make this work, we need clubs, media and fans pulling together, along with local government and sporting authorities. Obviously on-pitch success brings with it greater attention, not just within the UK, but worldwide. That point should not be under-estimated. Sheffield football would be a more marketable product and attractive to outsiders with top level football. Hopefully we will not have to wait long for that to be remedied. Readers may have differing views as to who they want to see fix that issue. In the meantime there is no harm in putting a plan together. Much of this can be put in place now. Much of what I am proposing has as much benefit to local football followers as those from outside of the city, but it provides a structured and coherent platform to move forward from, something that the city and the sport lacks at present. They are in no particular order but pick out the selling points and action points to achieve positive change. Sheffield is a city of football firsts. The city, the clubs and many undervalued individuals were pioneers in so many ways, more should be known about them. Aspects of the game that are taken for granted now originated in the Steel City. Sheffield clubs participated in other first time events, although some took place outside of the city. Each is part of a richly woven story of Sheffield football, alongside famous players, stories, joy, disappointment and tragedy. This is a story that needs to be told. The sub-plots at each club just adding to the narrative. It is too easy in football to look back with fondness and a sense of pride, especially at a time when on the pitch success has been limited. Therefore it is worth remembering that the future is just as bright and in the youth of the city there is another achievement to be proud of. The Sheffield Junior Football League is the biggest in the country, possibly Europe, with 992 teams and over 12,000 players registered. What promise for a successful future and what a platform to build on in the world of youth football. The FA, for all their many faults clearly see improving grassroots facilities as important and in choosing Sheffield as the pilot for a new scheme they clearly recognise the depth of the thriving junior and local leagues. The first part is to map out all of the existing football facilities and establishing what the needs of the city. The second stage sees the FA work with the council, County FA, professional clubs, local league and clubs and other local partners to understand what investment is needed in facilities to ensure football in the city can thrive. Ostensibly this will see investment in more 3G pitches leading to better facilities, better playing conditions, better player development. With such an impressive heritage and a solid base for the future, what changes can we make to maximise the returns on this superb infrastructure and compelling story. With two football league clubs and a further 4 down to Step 10 of the football pyramid, there is something for every fan and every budget in Sheffield. Looking beyond the city boundaries there are a further 11 clubs in South Yorkshire and another 6 within 25 miles of Sheffield city centre. This sounds great until you realise that not all of the 6 Sheffield based clubs are playing in Sheffield. For the city to develop their football offering and suitably back their claims to be the City of Football then all teams should be playing here, not least the World’s Oldest Club that takes the city’s name. Sheffield FC have played at the Coach & Horses ground in Dronfield for 13 years and whilst within a Sheffield postcode, it is outside the city boundaries. The Coach & Horses is a neat little ground developed by the club with the added bonus of the pub attached which provides, pre-match drinks, half time refreshment and post-match solace in a pint. The fact remains they don’t play in Sheffield. Handsworth Pararmore play out at Worksop in Nottinghamshire, 16 miles from the club’s junior set up in the Sheffield suburb from which they were born. Unable to develop their existing junior facilities at Olivers Mount, the club are seeking a site for a new ground and community facilities in Handsworth and finding plenty of challenges en-route. Yet, whilst this has happened, the city council and sporting authorities are facilitating other sporting clubs finding a permanent home in the city. On the site of the old Don Valley Stadium (once home to Sheffield FC) there will be a new community stadium built, for use by Sheffield Eagles and while I wouldn’t want to decry the Eagles and their important role in the city, the community and the city’s sporting offering, one can only wonder why the city leaders are not so welcoming and open to football. Could there not be a smaller scale football ground in the complex, also with the benefits of the EIS and University Technical College? It's a simple thing, but co-ordinating match days and kick off times could have a positive impact for Sheffield football watchers. Clearly you will find very few people who choose to attend both Bramall Lane and Hillsborough, but why not make it easier to watch their club and another local side. A move away from 3pm Saturday kick-off would upset the traditionalists, it would need the agreement of respective leagues and opponents and some fixture co-ordination, but what an opportunity it would provide. At a much higher level Tranmere Rovers played on Friday nights for a number of years to avoid clashing with an Everton or Liverpool fixture and whilst Friday nights are an option what about Saturday lunchtimes? A 12 o'clock kick off at Sandygate would give time for fans to head on to Bramall Lane or Hillsborough. A similar kick off time at Bracken Moor would allow fans to have a couple of beers, watch Park Steels and head on to Hillsborough. Then there are midweek dates. Last season Sheffield FC Chairman Richard Timms held an Ask the Chairman session, inviting questions at both a Q&A and online. A point I raised was that many midweek fixtures for Club clashed with United fixtures, stopping me from attending their games. With Wednesday having moved their midweek night from Wednesday to Tuesday; would it not make more sense for Club to play on Wednesday nights? Again giving more people the chance to attend? If only on an irregular basis, it would still add vital funds to the club coffers. The suggestion was acknowledged, but Club fixtures remain on a Tuesday night. The same applies to Handsworth, Hallam and Stocksbridge. It is harder for these clubs, reliant on part time players with other commitments, to make these changes, but it is something that could have incremental financial benefit. The Star has a "Grassroots" pull out section with reports, results and fixtures from all levels of the football pyramid and Sunday League details as well. Yet Radio Sheffield have only taken an interest in our teams outside the Football League when Sheffield FC have participated or organised a special event; such as the Pioneers Cup, or when they played at the San Siro. The previous Sports Editor at Radio Sheffield had little interest in sport beyond local professional football, with other city sporting teams struggling for detailed coverage and support. The incumbent Sports Editor recently bemoaned the lack of local football, with United, Doncaster and Chesterfield’s League One games hit by international call-ups and Championship games already postponed. He pondered how he was going to fill a Saturday afternoon sports show. I tweeted him, pointing out it was a national Non-League Day and there could be a great opportunity to broadcast live from a local club, with features and interviews in and around match-day. Other reporters could be elsewhere in the region. I didn’t get a response. There was a time when Radio Sheffield used to broadcast results and reports from non-league games on a Saturday, breaking away from the phone-in for 5 minutes for Brian Bradley's round-up. Now they would much rather let someone speak about a game they haven't been to, or try and wind up opposition fans with their wonderful "banter" and trolling. Although it is great that the clubs get the news coverage, it wouldn't take much to read out the results of South Yorkshire teams. It isn't as if there is a need for someone in the office to ring around the clubs to collate them, social media updates will do the job. You could argue that social media has replaced some of the more traditional reporting of papers and broadcast media. Why worry about reporting on the radio when if someone is interested they could quickly get a score update from a twitter or Facebook account, but I think there is more to it than that. It is about creating a feeling of credibility and importance about our local clubs and their history. The Star, Radio Sheffield and now Sheffield Live TV could play a role is establishing that feeling that these clubs are still vital to the city. I remember the Manchester local television station Channel M had a weekly football show on Saturday mornings, showing non-league highlights and interviews from the football league clubs. There is no reason why Sheffield Live TV could not have a similar football show each week. Much has changed in terms of technology and media since the Channel M show. A lot of non-league clubs now video their games and have audioboom or videos of post-match interviews. It doesn't take expensive technology and can easily be shared to a wider audience. For those who are finding themselves and their families priced out of attending professional football, they need to know there is a compelling alternative. Going back nearly 20 years there were local media reports of Sheffield looking to build a World Football Museum. I recall plans for a giant football shaped structure off the M1 near Meadowhall. Whilst I was at University, around the same time, a number of academics were involved in either that, or a similar project, and i had initial discussions about being involved. Sadly it never progressed. Sheffield would have been a natural home for a Football Museum, either on a World or National stage and the fact that the National Football Museum has been at Preston and now Manchester does not seem right given Sheffield's place in football history. A visit there sadly shows little mention of Sheffield FC or the city’s role in the development of the game. With the National Football Museum seemingly settled in the Urbis building in Manchester, maybe Sheffield should look at having its own museum, charting the birth of football and the city's deep rooted involvement. Sheffield United has a great little museum - Legends of the Lane, Sheffield FC have a display of artefacts at the Coach & Horses ground, but there must be much more to display. Wednesday has no museum or public display and Hallam must have items which tell a story, given the club’s age and history. I accept that bringing this all together in one place would not be easy. There are huge benefits to the clubs in keeping such displays in-house, for United the Legends of the Lane is a key part of stadium tours and a place to house hospitality guests on match day. But what about using exhibition space in the city centre to display artefacts create an interactive story telling of football in Sheffield? Exhibits could rotate around; visitors encouraged to go and see further club specific displays at each ground. The city centre has so many empty spaces. There are display areas in the Millennium Galleries that could host permanent exhibitions. Could the clubs work together with the Sheffield & Hallamshire FA to deliver it? If another city had the football heritage Sheffield has there would be brown signs off the motorway and Parkway, there would be places to visit - to celebrate and learn, there would be football trails to the historic sites. With a thriving junior football league, impressive facilities across the city and further investment planed, there is a real opportunity to build on this competitive structure and hosting capabilities. Sheffield could host a high quality international youth competition. Each year Sheffield United send representative sides to the Milk Cup competition held across several towns and cities in Northern Ireland. They have played against sides from across the world and in 2009 beat FC Porto in the semi-final, before losing to Manchester United in the final. Our top junior sides have travelled to Belgium, Netherlands and Germany and taken on the best junior sides. Why not have a tournament here? With the added attraction of potentially playing on historic grounds. A cup competition for youth football in the city that introduced the first knockout football cup competition. The city has already made good football links and these could be used to further promote the city and its clubs. Although little mention is made of Ferencvaros and Chengdu Blades these days, United still have links with Central Coast Mariners and now have a connection with Fenerbahce through board member Selahattin Baki. The city itself is twinned with Bochum and Donetsk surely giving opportunities to broaden those links through football. Sheffield FC have initiated the Club of Pioneers; identifying the pioneering clubs who formed first in their respective countries. Following the lead of Sheffield FC, club such as Recreativo Huelva, Genoa CFC, Koninklijke Haarlem FC have been identified and fielded representative sides of former players and fans in competitions between the two. Attracting small bands of vocal followers to each other's grounds. The idea of the Pioneers Cup provides not only a great marketing opportunity for Sheffield FC but for the city as a whole to support such a tournament and welcome new visitors. This tournament could be developed into a full pre-season competition over 3/4 days. These club links again could be vital in facilitating a sizeable youth tournament in the city. It could also create real opportunities to bring new people to the city to learn about Sheffield's place in the development of football. If you go to the Welcome to Sheffield website, click on Visit Sheffield, the Top 10 attractions have nothing football related. Click on the Attractions in the sub-menu and you are offered Sport as a choice. Click on Sport and the header says "In Sheffield, sport is more passion than play. Which is not surprising in a city which boasts the (….did this originally say Don Valley Stadium?) 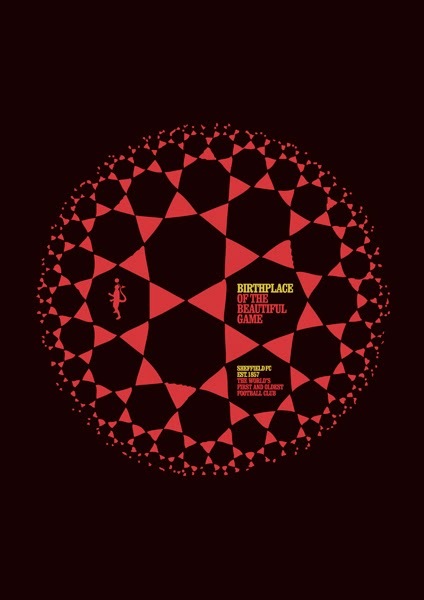 and where some of the world's best athletes train." It then takes you to Climbing and Golf Courses. A sub-menu to the left offers a link to Sport to Watch. "You shouldn't be surprised by the range of sport you'll see in Sheffield, and you'll probably have heard of Sheffield as 'the first National City of Sport' but did you know that there's a lot more than that to thank the city for? Sheffield is home to the oldest football club in the world... recognised by FIFA, Sheffield FC has been in existence (sic) since 1857. That means we can genuinely claim Sheffield as 'the home of football'"
A huge claim tucked away in the website. Like the people of the city, proud, but we don't like to talk about it. Sheffield is a city that doesn't like to shout about its success, lest some outsiders hear about us and come and spoil it. Nor do we mention all our clubs or history, with United, Wednesday and Sheffield FC all benefiting from links on the city’s marketing website, but nothing for Hallam (steeped in history of their own), Stocksbridge or Handsworth. This lack of profile has to change and can be easily remedied. Figures compiled by VisitBritain during 2012 show that 900,000 football supporters visited Britain last year. Football tourists collectively spent £706m, or £785 per fan – £200 more than the average visitor to Britain – with many arriving during the traditionally quieter period for tourism between January and March. Four in ten of those who attended a match said watching sport was their principal reason for visiting the UK. Football was also found to encourage visitors to explore beyond London. Unsurprisingly, the stadiums attracting the largest number of overseas fans were in the north-west, but that doesn’t mean Sheffield couldn’t offer an alternative. The ability to travel overseas and take in several matches (at different levels) over the course of a weekend is proving increasingly popular. Yes, people want to go and watch Dortmund, Barcelona, or Real Madrid. Yet on that same trip they will be just as likely to pay a visit to the vibrant terraces of Preußen Münster, L’Hospitalet, Alcorcon and get as much enjoyment out of that game and experience. "The Football Tourist" is a market Sheffield ought to be primed to exploit. Staggering fixtures and kick offs would of course be needed. If you can make Sheffield a football attraction, the city can build on this Throw in the city's reputation for Real Ale and breweries and you have a heady combination that should attract ardent football watchers. Giving football fans a bigger reason to visit. Making the city a doubly attractive destination of choice. Whilst the opportunity to tie in to the Kelham Island brewery/pub scene, or the city's wider real ale trail is certainly a positive link, more could be done to encourage visits alongside other big events, such as the month long Last Laugh Comedy Festival in October, or the Off the Shelf literary festival. The city could develop a wider strategy to capitalise on football tourism, encouraging fans to stay and explore the city and surrounding areas, use local businesses and visit tourist attractions. The Off the Shelf festival offers a really good opportunity. Other cities are developing a Sports/Football Writing festival (events in London, Manchester and Bristol immediately spring to mind). These events combine authors and journalists, alongside former sportsmen telling their stories and talking about how they found their voice, their style in writing. Why not put on a week devoted to football or sports writing as part of Off the Shelf, rather than the odd event? Time it for a week when there are midweek fixtures, so from Saturday to Saturday there are football related events and matches across the city. Whenever there is a big event in the city, banners appear at the top of lampposts around the city centre advertising the event with branding and imagery. Why not do the same to sell the Birthplace of Football? Utilise the big banner on the side of the Central Library/Graves Art Gallery. Welcome to Sheffield – The Home of Football. Contract a designer to make something vibrant and eye-catching. I would suggest the guys at goalsoul, the Sheffield based designers inspired by the eclectic and rich cultural tapestry of football around the world, who still show pride in their home city in many of their designs. 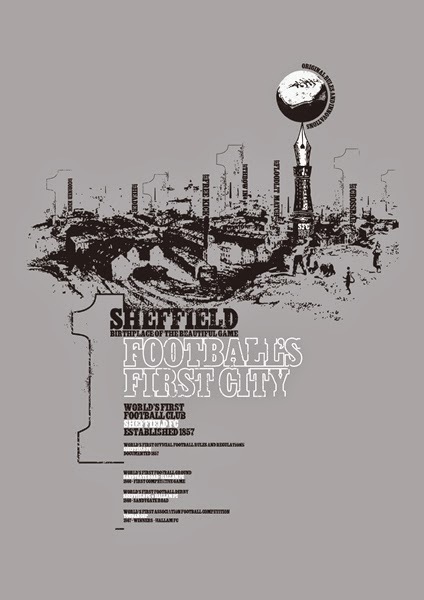 Their artwork, telling the stories in images and words, is used in this post and many of their t shirts and art prints celebrate Sheffield football; the clubs and the history, as well as the stars and the lesser known heritage of the world game. So there you go. Eight initial ideas, just over 3,700 words. I am sure you, as a reader and Sheffield football fan, could add more. If you can, please add them in the comments section to this post. I would like to think of this as a live post for new ideas to be added, new initiatives to gain attention. So what now? These are ideas, some quite simple to implement and some with little incremental cost. We need to get this post shared, to clubs, to council, to the local FA, to the city’s cultural leaders and marketers. I am not saying this Blueprint must be followed, but it could initiate a discussion that leads to some actions being taken. I am sick and tired of our city under-selling itself, of our clubs not thinking creatively about how they market themselves. For a city of football firsts, we should not accept being viewed as second best, or mid-table fodder. Sadly I feel that we have been negligent to date and allowed this to happen. As a city we can choose to sit back as cities such as Leeds or Manchester show some foresight and take another leap forward, with new investment, new innovation and define themselves as "go to" cities, leaving us further behind. We can moan about Liverpool, Nottingham, Newcastle or Bristol attract investment and develop. Or we can look at what defines us as a city, where history was made and where we can support and develop clubs and sport for the benefit of us, the clubs and the city as a whole. This is more than just supporting United and Wednesday, it is about supporting grassroots football and ensuring it is maintained and preserved. The last thing we want is to be focusing on the history, because the history is all we have left. Great article - hope it kicks off a discussion and that we can get people at Sheffield Council engaged. See also my post at: http://stevek1889.blogspot.co.uk/2014/05/sandygate-worlds-oldest-football-ground.html on similar themes. There is scope for much more here: not all of it needing money: we just need to speak up a bit more about our heritage: teach it to our kids, challenge the sloppiness of calling MUFC 'United' etc. Last season I overheard some German fans at Sandygate: why would any football fan not want to pay a pilgrimage: it is a beautiful ground in many ways. Sheffield needs recognition for it's vital contribution to the history of football. You mention grassroots and junior football, this is where Sheffields legacy will continue to grow from. The youth of the city need to know the proud heritage of where they live. Sheffield schools, with the help of grassroots volunteers could have an annual football tournament that coincides with a week of local history lessons and visits to historical places. The tournaments would attract sponsorship, media attention and awareness, maybe it would help fund and show the importance of the museum you mentioned. As a Wednesday fan I've just discovered this blog and I'm very pleased I have. good entertaining views and a sensible idea over kick off times.